The Funkoars Announce National Australian Tour! 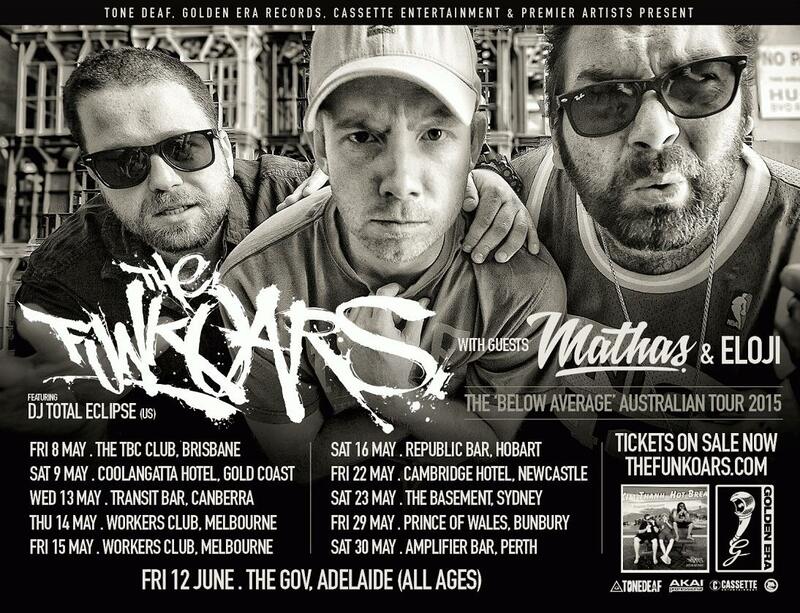 The Funkoars are pleased to announce their forthcoming National ‘Below Average’ headline tour this coming May/June, proudly presented by Tone Deaf, Golden Era Records, Cassette Entertainment and Premier Artists. Tickets for all shows on the ‘Below Average’ Tour are on sale now. In 2015 Australia’s favourite hanger-oners The Funkoars have announced their ominous return from the smoke and mirrors, bringing hard 80s street justice back into fashion in the form of their forthcoming fifth full length album “In Case of Emergency”. The first offering from the forthcoming album is the brand new single “Below Average”, an above average song where the ‘Oars remind themselves and the listener that it’s not only ok to be a failure at everything you attempt, but it’s encouraged. In support of this new teaser single the squad take the road back into their cold, sweaty palms this coming May/June, and will be bringing a taste of the new record to life on stages across the country. With live shows known for their sweaty, MOOSTY and most of all deafening energy, testing out some brand new material and some older classics, these in your face shows are not to be missed. Sealing the deal of danger and joining the gents behind the 1’s & 2’s is none other than the almighty Dj Total Eclipse of the Xecutioners/Living Legend status, and to round out the evenings experience phenomenal Perth MC Mathas will be joining the squad, alongside Melbourne up and comer Eloji as national supports. In Case Of Emergency – What Will You Do! ?